The outstanding boys' high school student Miki Masami's not-so-outstanding part-time job is at the somewhat suspicious detective agency, "Tsukumo's Detective Office". His superiors, Jinnai Hajime and Kiuchi Kan, are very cool, but considerably eccentric individuals. Though he finds the days of Jinnai calling him the "destined child" troubling, what concerns Miki more is Jinnai and Kiuchi's overly intimate relationship...! 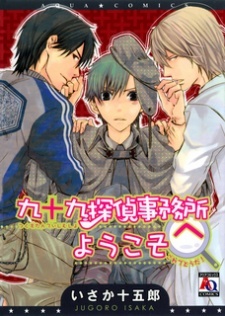 The love triangle comedy of the puzzled detectives ♥, followed by the compilation of "Koibito Kankei" (A Lovers Relationship) with the concerning Kiuchi and a brute glasses-wearing boy.